Occasionally music starts as something simply to put out there without expectations. Either new artists who don’t have any buzz, or older artists who haven’t released an album in years, put something out to the masses without any anticipation of high sales. In today’s blog, not only did the band start as a bit of a joke, but no one would have ever imagined the popularity they’d achieve. In January of 1976 Saturday Night Live featured a sketch called “Howard Shore and his All-Bee Band.” John Belushi was singing and Dan Aykroyd was on the harmonica dressed in bee costumes. Akyroyd rented a blues bar for the cast members to attend during the week, where you could go and listen to music or literally jam on the various instruments on stage. It was at this very bar Akyroyd and Ron Gwynne would write a movie, and introduce Belushi to blues music. That introduction turned into fascination, and the bee sketch was about to evolve into a full-on blues band sketch, with SNL band leader Howard Shore suggesting they adopt a sibling story and called themselves “The Blues Brothers.” Famed musician Paul Shaffer helped the duo by assembling a collection of studio talents to form the band. What started as a fun sketch, was turning into a serious band with very serious musicians. 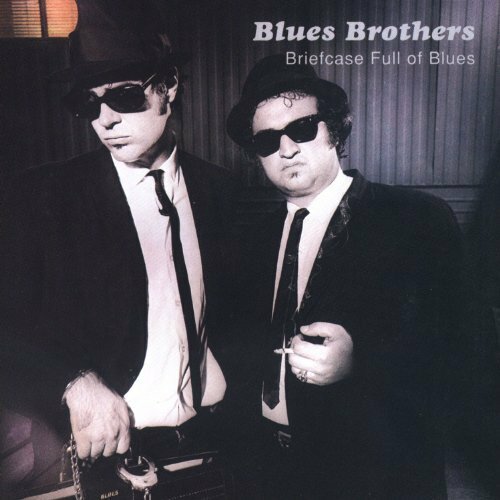 The Blues Brothers released Briefcase Full Of Blues in November of 1978. Recording took place just a few months before on September 9th at the Universal Amphitheater in Los Angeles. The band opened for comedian Steve Martin who they guessed would bring a good crowd to record with. Shocking everyone, the album reached number on one the Billboard 200 and went double platinum with more than four million copies sold to date. That may not seem like a lot, but it is among the highest-selling blues albums of all time. The liner notes of the record fleshed out the fictional story of Jake and Elwood, having them grow up in Illinois and learning blues from a janitor named Curtis—and becoming ‘brothers’ by cutting their middle fingers with a guitar string and sealing their blood brotherhood. The success was so positive; the infamous film began shooting and was released in 1980. It’s a total cult classic and still sees a lot of airplay on television and premium cable to this day. Almost hard to imagine, but this album is teetering on iconic. It plays like a live blues record, not necessarily an SNL skit. They could have gone that direction, but the desire to take the act seriously and hire legit musicians really comes through in the sound. Maybe Belushi isn’t angelic vocally, but the upbeat nature of the album combined with the outstanding background sound, makes it a very fun listen. All of the tracks are covers; some classic, some lesser known blues standards – done The Blues Brothers way. You take a staple like “Soul Man” and jazz it up the way they do, and it’s no wonder it became a radio smash hit. Akyroyd’s harmonica skills are outstanding and featured properly throughout the record. Most of the band would go on to be featured in the film and that’s such a neat idea. A bunch of these guys had doubts about the initial formation, but two years later to be featured in a film, that’s pretty cool. Belushi passed away in 1982 after a battle with drugs and alcohol abuse. While the band didn’t technically end with his death, it would never be the same again. For those couple years though, this band was on top of the world, and introducing so many to what real blues was. Groove yourself today for $5 bucks, guaranteed to get your toes tapping. Big 10 Network is here, there—everywhere!